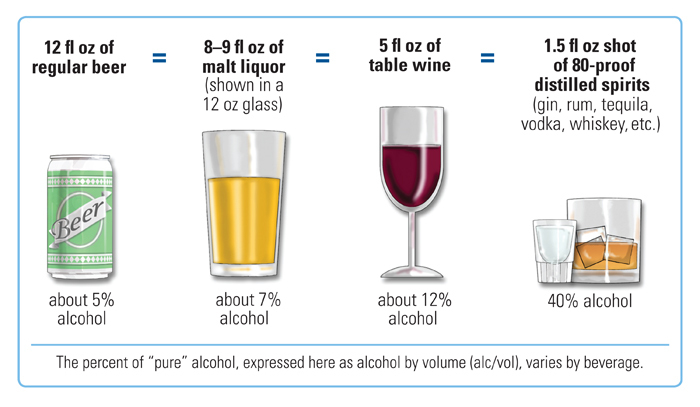 Alcohol equivalence is emphasized as being important for drinking in moderation by the National Institute on Alcohol Abuse and Alcoholism(NIAAA), Department of Transportation (DOT), Department of Health and Human Services (DHHS), American Dietetic Association, National Consumers League, National Council on Alcoholism and Drug Dependence (NCADD), and Mothers Against Drunk Driving (MADD). The long-term effects of alcohol (ethanol) consumption range fromcardioprotective health benefits for low to moderate alcohol consumption in industrialized societies with higher rates of cardiovascular disease to severe detrimental effects in cases of chronic alcohol abuse. 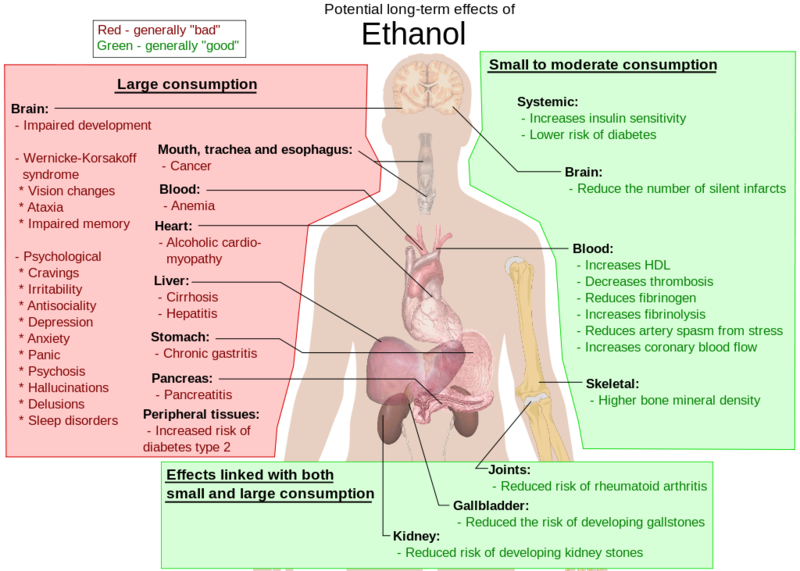 Health effects associated with alcohol intake in large amounts include an increased risk of alcoholism, malnutrition,chronic pancreatitis, alcoholic liver disease, and cancer. In addition, damage to the central nervous system and peripheral nervous systemcan occur from chronic alcohol abuse. The long-term use of alcohol is capable of damaging nearly every organ and system in the body.The developing adolescent brain is particularly vulnerable to the toxic effects of alcohol. In addition, the developing fetal brain is also vulnerable, and fetal alcohol spectrum disorders (FASDs) may result if pregnant mothers consume alcohol. The inverse relation in Western cultures between alcohol consumption and cardiovascular disease has been known for over 100 years.Many physicians do not promote alcohol consumption, however, given the many health concerns associated with it, some suggest that alcohol should be regarded as a recreational drug, and promote exercise and good nutrition to combat cardiovascular disease. Others have argued that the benefits of moderate alcohol consumption may be outweighed by other increased risks, including those of injuries,violence, fetal damage, liver disease, and certain forms of cancer. Withdrawal effects and dependence are also almost identical.Alcohol at moderate levels has some positive and negative effects on health. The negative effects include increased risk of liver diseases,oropharyngeal cancer, esophageal cancer and pancreatitis. Conversely moderate intake of alcohol may have some beneficial effects ongastritis and cholelithiasis. Of the total number of deaths and diseases caused by alcohol, most happen to the majority of the population who are moderate drinkers, rather than the heavy drinker minority. Chronic alcohol misuse and abuse has serious effects on physical and mental health. Chronic excess alcohol intake, or alcohol dependence, can lead to a wide range of neuropsychiatric orneurological impairment, cardiovascular disease, liver disease, andmalignant neoplasms. The psychiatric disorders which are associated with alcoholism include major depression, dysthymia, mania,hypomania, panic disorder, phobias, generalized anxiety disorder,personality disorders, schizophrenia, suicide, neurologic deficits (e.g. impairments of working memory, emotions, executive functions,visuospatial abilities and gait and balance) and brain damage. Alcohol dependence is associated with hypertension, coronary heart disease, and ischemic stroke, cancer of the respiratory system, and also cancersof the digestive system, liver, breast and ovaries. Heavy drinking is associated with liver disease, such as cirrhosis. Excessive alcohol consumption can have a negative impact on aging. Recent studies have focused on understanding the mechanisms by which moderate alcohol consumption confers cardiovascular benefit. Binge drinking or heavy episodic drinking is a modern epithet for drinking alcoholic beverages with an intention of becoming intoxicated by heavy consumption of alcohol over a short period of time. It is a style of drinking that is popular in several countries worldwide, and overlaps somewhat with social drinking since it is often done in groups. The degree of intoxication, however, varies between and within various cultures that engage in this practice. A binge on alcohol can occur over hours, last up to several days, or in the event of extended abuse, even weeks. Due to the long-term effects of alcoholmisuse, binge drinking is considered to be a major public health issue. Binge drinking is associated with a profound social harm, economic costs as well as increased disease burden. Binge drinking is more common in males, during adolescence and young adulthood. Heavy regular binge drinking is associated with adverse effects on neurologic,cardiac, gastrointestinal, hematologic, immune, musculoskeletal organ systems as well as increasing the risk of alcohol induced psychiatric disorders. A US-based review of the literature found that up to one-third of adolescents binge-drink, with six percent reaching the threshold of having an alcohol-related substance use disorder. Approximately one in 25 women binge-drinks during pregnancy, which can lead to fetal alcohol syndrome and fetal alcohol spectrum disorders. Binge drinking during adolescence is associated with traffic accidents and other types of accidents, violent behavior as well as suicide. The more often a child or adolescent binge drinks and the younger they are the more likely that they will develop an alcohol use disorder includingalcoholism. A large number of adolescents who binge-drink also consume other psychotropic substances. The liver metabolizes up to 85% – 98% of the circulatory ethanol. The liver uses two metabolic processes to get rid of this circulatory ethanol as quickly and safely as possible.